"With over 30,000 full-time undergraduates (and another 3,500 part-timers), the Ohio State University is like a small city that has "anything and everything both academically and socially." As an added perk, OSU is extremely affordable. Students caution, however, that "you must get involved" to have an enjoyable experience here." What is a typical Ohio State University-Newark Campus student like? Describe the type of person that should attend Ohio State University-Newark Campus. You should be motivated and willing to do the schoolwork. There are honors students, but the majority of students don't keep up honors but work very hard to get their degree. What are the top 3 reasons someone should attend Ohio State University-Newark Campus? What was a typical Ohio State University-Newark Campus student like in high school? Describe the type of person that should attend Ohio State University-Newark Campus. Envision a school with almost 50,000 students and too many opportunities to count. Has its own airport not every university can boast that. The university's great reputation and affordable cost make it a good choice for anyone looking at large schools. Lots of international students study at OSU, which makes this Midwestern school more diverse. The Ohio State University at Newark and Central Ohio Technical College are proud of the partnership that they have forged in offering an outstanding array of educational opportunities. The Ohio State University at Newark offers the best of the Big Ten educational experience, including a rich research heritage and academic excellence. Students at Ohio State Newark can complete bachelor's degree programs in education, nursing (RN to BSN), general business, English, history and psychology. Students can also complete master's degrees in Early/Middle Childhood (M.Ed.) and in Integrated Teaching and Learning (M.A. ), and can complete most of the coursework necessary for a master's degree in social work (M.A.). For other Ohio State degree programs, students can complete many of the course requirements here in Newark and then transfer to Columbus. Ohio State Newark is the largest of Ohio State's regional campuses with 50 distinguished faculty members and a student body of more than 2,100. At Central Ohio Technical College, students can earn one of 31 associate degrees or certificates, or gain skills needed for career advancement. Many students attend a two-year institution to gain hands-on, technical experience and begin working in the field, or to transfer those credits toward a bachelor's program. COTC offers a low faculty-to-student ratio that appeals to many students. Headcount enrollment at COTC (including extended campus locations) reached 3,000 in autumn of 2005. Both Ohio State Newark and COTC pride themselves on providing the student with personal attention, state-of-the-art technology labs, and credentialed and experienced faculty on a beautiful, technologically sophisticated campus. Choose the institution that best suits your needs and head down the path to success. 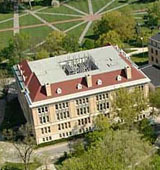 To increase collaboration and cooperation among public colleges and universities, in August 2007 Ohio Governor Ted Strickland directed Ohio Board of Regents Chancellor Eric Fingerhut to establish The University System of Ohio, which includes 14 public universities with 24 regional campuses, 23 community and technical colleges, and an adult workforce education and training network operating in more than 200 locations. With a mission to provide affordable, high quality higher education opportunities for all Ohioans, programs and curricula are designed to meet Ohioans' individual and collective needs for the 21st century. Governor Strickland also directed Chancellor Fingerhut to develop a 10-year plan for The University System of Ohio, which will set clear benchmarks and a timeline for advancing a collective system of higher education in the state. To learn more about the University System of Ohio and the Chancellor's Strategic Plan for Higher Education, visit the University System of Ohio web site at http://uso.edu/index.php. What are the top 3 things that students do for fun at Ohio State University-Newark Campus? 43% of students received Pell Grants, which are provided by the U.S. government to students from middle and lower income families. It gives you an idea of a school’s socio-economic diversity. Campus housing is available for undergraduates. Housing deposit : $300.00. Housing deposit is partially refunded if student does not enroll.. Freshman allowed to have car. No pets. 8% of students live on-campus. 14% of freshman live on-campus. 59% of students graduated in the top half of their class. 22% of students graduated in the top quarter of their class. 4% of students graduated in the top tenth of their class. The average student pays $14,926 for tuition, fees, and other expenses, after grants and scholarships. Total stated tuition is $6,912, in-state and on-campus, before financial aid. Learn more about financial aid at http://newark.osu.edu/currentstudents/financialaid/pages/default.aspx. Estimate the net price for you at http://sfa.osu.edu/npc/. 19% of students graduated on time. 43% of students graduated in six years. 56% of full time students continued studying at this school after freshman year. Want more info about Ohio State University-Newark Campus? Get free advice from education experts and Noodle community members.